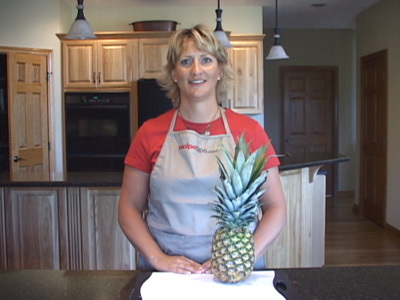 RecipeTips.com's video to show you how to clean a fresh pineapple. For more information on pineapple and recipes visit RecipeTips.com. Today I am going to show you how to clean a pineapple. For more information on pineapple and recipes, visit RecipeTips.com. To begin cleaning your pineapple, lay it down on its side on a cutting board. Begin by removing the plume of the pineapple by slicing straight down through the top. You are going to want to do the same thing on the bottom of the pineapple. Slice right through and this is going to give you a nice stable base to remove the rind from the pineapple. Begin slicing thick enough that it goes through the eyes of the pineapple. You want to follow the curve of the pineapple as you go. Once the rind has been removed from the pineapple you will notice that there are some eyes remaining. Simply just take your knife, and slide down, to remove any excess eyes. Begin by slicing your pineapple in half, lay your halves down and cut them into quarters. Once your pineapple has been quartered, we going to want to remove the central core from each piece. Hold the pineapple up on end, and carefully slice down to core the pineapple. Once you have removed the core from your pineapple, begin cutting wedges from the pieces, these can be anywhere from a quarter to a half inch thick, and is now ready to use in your favorite recipes or to eat fresh.